Jamelsley Pyracantha at Dakata J.W. Information on Jamelsley Pyracantha at Dakata J.W. Judge's critique 1st & BP Gardinor’s Jamelsley Pyracantha at Dakarta.A realy nice black spotted puppy dog at just 6mths old a real baby, lovely head and expression nice Dark eye colour , clean neck and front, good depth of brisket, level topline keep on the move , correct tail set and well angulated hind quarters giving him a lovely driving action., a very promising puppy. Judge's Critique ~ 1ST GARDINOR: JAMELSLEY PYRACANTHA AT DAKATA. 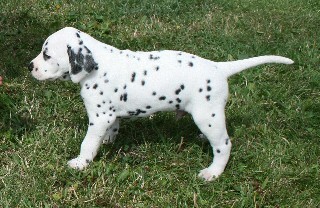 Smart blk/wh puppy dense black markings on pure white coat, presents a pleasing balanced outline. masculine head with good length of neck into well placed shoulder, well ribbed up and short loin super hindquarter angulation , good tail set and well carried moved well showing good length of stride , should have a bright future. Best puppy dog. Judge's Critique ~ GARDINOR’S JARMELSLEY PYRACANTHA AT DAKATA Confident youngster who has many attributes on his side, adequate bone, tight elbows, nicely ribbed, good loin through to sound angulations in rear. Good tail set and length. One who moved steadily using his shoulders to pull through with drive from the rear, feet in good order. Head proportionate and despite his general demeanour he refused to use his ears and flew them which spoilt the overall picture. Clean condition & body pigmentation. held on the move. BPIS. 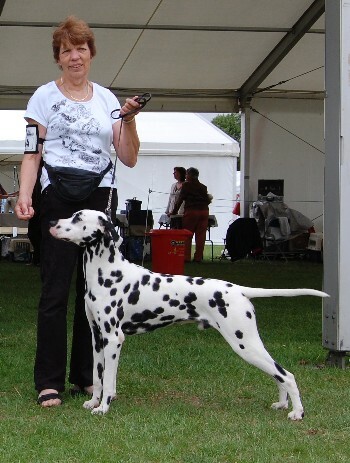 Judge's Critique ~ 1ST	JAMELSLEY PYRACANTHA AT DAKATA (MISS T A GARDINOR) Whilst going over this ten month old puppy, I could truly understand why he had won so many awards. He offers so much, correct size, exquisite head, correct bite, dark eye and well broken ears. Well bodied with deep brisket, level top level with correct tail set. Excelled on the move, I was pleased to award him Best Puppy In Breed. 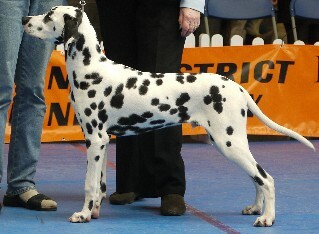 Judge's Critique ~ Gardinor’s – Jamelsley Pyracantha at Dakata 11mth boy that is getting depth of body. Just starting to settle to size & showing maturity. Nice lay of shoulder. Moved with a steady pace in a difficult ring. neat front & shoulders, good depth of chest & topline, tight feet. Gardinor’s Jamelsley Pyracantha at Dakata Lovely deep black pigment on this well put together dog. Good dark eye, good reach of neck flowing into good front angulation, level topline, good bend of stifle and correct tail set. Being a bit of a teenager giving his handler a hard time but showed good movement when he settled. Judge's Critique ~ Miss T Gardinor Jamesley Pyracantha at Dakata . B/W dog, well balanced with a clean out line. Gentle expression, Lovely dark eye, ears broken framing his face, fair length of neck flowing into good shoulders, elbows tight to chest, which has a good depth to it, lovely turn of stifle. Topline strong, moved with grace, effortlessly around the ring. good spotting but black spots need to clear. Good movement in profile but front movement needs to tighten. with good forechest, strong bone, good topline and tailset. Judge's Critique ~ Gardinor’s Jamelsley Pyracantha At Dakata. Eye-catching b/w, 15.5 mths old, with a constantly wagging tail. A very promising youngster well made in all departments. Attractive markings on a good coat. Lovely head with powerful muzzle. Dark eyes and well broken ears. Deep chest with level top line into correctly set tail. Tight cat feet. Correct angulation and a lengthy stride with reach and drive on the move. Judge's Critique ~ Gardinor’s Jamelsley Pyracantha at Dakata JW. B. Won this class with ease. Pleasing head of equal proportions, moderate stop and powerful muzzle Dark eyes with full pigmentation. Sufficient arch to neck into shoulders, down to ample depth of chest. He had bags of strong round bone and first-class cat feet. Well sprung ribs and strong loin he had the power and freedom in his movement to have gone all day. Straight and true both front and rear.  Clear defined spotting on a white coat. Pleased to award him RCC. good front and strong rear quarters meant he looked a picture standing and, although he took time to settle, he showed power and drive on the move. Judge's Critique ~ Gardinor’s Jamelsey Pyracantha at Dakata, beautiful outline. Good head. Good construction. Moves well behind but rather loose in front. Good colour. Nice dog. Judge's Critique ~ Gardinor’s Jamelsley Pyracantha at Dakata JW. One I have admired before, he has matured well. Masculine but with no coarseness. Excellent clear spotting, good head shape and proportions. Excellent lay of shoulder, correct angulations, well- muscled, covered the ground with ease. moved well though a little loose at the shoulder. Judge's Critique ~ Gardinor’s Jamelsley Pyracantha at Dakata, well marked face, good shoulder, deep brisket, good stifles, moved well. and good length of neck but. Really strong quarters, stifle and thigh. Difficult to asses on the move today. 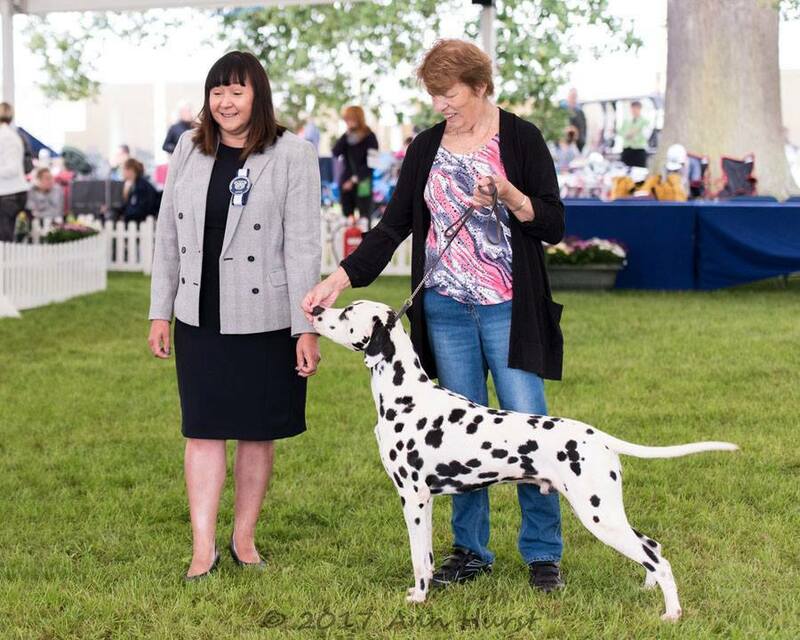 Black spotted dog of correct size, lovely head with dark eye and well broken ears, Clean neck into level top line which was held upon the move, just needs to mature but has a bright future, I was pleased to award his the Reserve CC, as well as Best Black Dog. 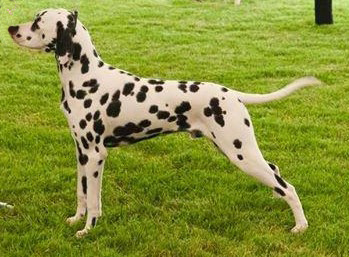 Beautiful bold spotting and excellent dark pigment, handsome head and good ear placement, lovely dark eye, good reach of neck, good layback of shoulder, good spring of rib, looking very fit and well-muscled, not overdone in any way, correct tail carriage, well-defined hocks, keeps his topline on the move, moved effortlessly around the ring. Dog CC. Gardinor's Jamelsley Pyracantha at Dakata JW Well consructed b/w Pleasing masculine head features with dark eye. Good pigmentation, clean wither, firm topline into good tail set. Well developed h/q. Positive driving action. Everthing to like about him. In final four for the challenge.